I’m a mom of two beautiful and brilliant daughters. I am in awe of the things they come up with. Sometimes this fun turns my house upside down, and their “inventions” run into the common areas of our home. My kids are only 5 so it’s OK. I fully recognize that at their age play should be the biggest way they are learning. I believe whole-heartedly that children must be allowed to explore in order for them to learn. I remember the day I came into our living room and my girls created a wheelchair. They used their skates and attached them to a wooden chair. Then they took turns wheeling each other around our house. I loved it, and I told them I did. My girls are builders. As my little inventor tells me, “Mom, I love Lego bricks because I can create things in my mind and then make them for real.” Because I am an up-tight mom who becomes claustrophobic when I am in a messy area or a room with way too much, I have given them a designated room in our home where they are free to create, build, imagine, explore, etc. Sure, I allow my girls to make whatever their hearts desire, and they do. Beautiful and Brilliant, we should say it everyday! I recently watched a Verizon ad that encourages parents to tell their daughters they are brilliant and inspire them to like science and technology, by doing so we then can encourage our daughters to change the world. 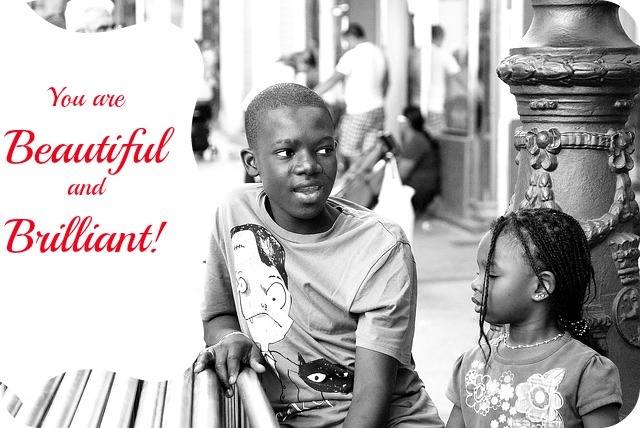 I challenge all parents to tell their daughters and sons they are beautiful/handsome and brilliant too. Get the entire family involved and be apart of an atmosphere where love and innovation is fostered. Reader Response question: What are some ways that you think parents can encourage their children to love Science, Technology, Engineering, and Math?